When we think about our favorite performers, so many burning questions come to mind. What do they like to do for fun? Where do they like to shop? Who are their favorite artists? What food do they love? Would we be BFFs? You think about all of these things, too, right?! Of course you do! So, we decided we wanted some answers and, luckily, those performers were more than happy to indulge us by sharing their road diaries. 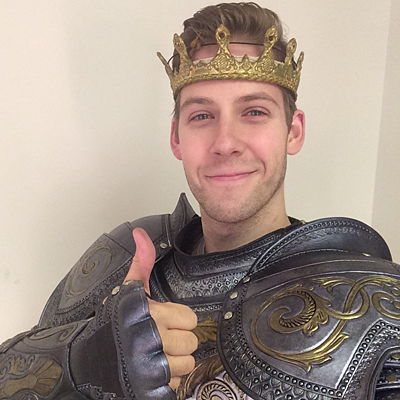 Andy Huntington Jones plays Prince Topher in the touring production of Rodgers + Hammerstein's Cinderella, and he told us that he loves Wicked, lets Harry Potter keep him company and has a popcorn addiction. Find out what else makes Jones tick below! Prince Topher wants, above all else, to do what's right, even when he is unsure of how to do it. He fights through his self-doubt and makes the world better. Topher is an inspiration to me and my fellow nerds. Living in the energetic possibility of New York City. From one young performer to another: keep at it until they say, "Yes." And keep going to class! We are never finished learning! I broke the rules; that was more than one. I usually couldn't go without my computer so I could Skype with my wife, but since she's in the show and we're on the road together, I'll say that the Harry Potter series is high on the list. Oliver! hooked me as a kid, but it was the original cast of Wicked that made me want to "run away and join the circus," so to speak. I try to go to the gym and move around before a show. I need to be warm before I jump onstage in 25 pounds of armor (beautifully designed by William Ivey Long). I bought a shirt today that I didn't realize was on sale until I payed. It's the little things. I have taken up rapping Hamilton both in and out of the shower. This is the cheesiest AND the cheesiest… Why didn't the cheese want to get sliced? It had grater plans. I love going to the movies and eating all the popcorn before the trivia slides are done.